Dr. Bhadauria is the best! She is quick and efficient but also will take the time to answer all your questions. Dr. Bhadauria is kind and knowledgeable. She take her time time answering your questions and doesn't rush through any of the appointment. I love using the patient portal - it's easy to use and communicate through. Her office staff are kind and helpful, as well. Looking forward to keeping Dr. Bhadauria as my OB/GYN! 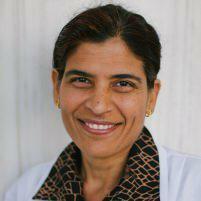 Dr. Bhadauria is the best doctor I have visited in recent years, she took care of me every time I visited the hospital. She takes time to answer all of our questions and explains everything that needs to be taken care of during pregnancy. Dr. Bhadauria is the best! she delivered both my girls. Love her like family. I recommend her to everyone. She takes her time explaining everything, she cares for her patients and most important she make you feel comfortable. Love you Dr.B you are the best doctor I know.